Spinal stenosis from fractured vertebrae is a relatively common cause of sudden, acute canal narrowing, particularly in elderly patients. A vertebral fracture can be a serious or rather inconsequential event, depending on the type of break suffered, the area of the fracture and the general health and condition of the patient. It is crucial to understand what any fractured vertebrae may entail, so that medical monitoring or active treatment can begin as soon as possible. This essay discusses how vertebral fractures may cause or contribute to central and foraminal canal impingement. Sudden and acute back injury can certainly cause a spinal stenosis or neuroforaminal stenosis condition to exist rather abruptly. A vertebra which fractures may send bone pieces into the central canal or the foraminal spaces, potentially enacting a partial or complete stenotic effect. In cases of severe trauma, vertebrae are often fractured in multiple locations, sending many tiny pieces of bone into the central canal in the worst scenarios. These circumstances often require invasive spinal surgery, not only to clear the central canal space, but also to rebuild or stabilize the fractured bones before instability can overtake the vertebral column. Compression fractures are the most common type of vertebral breaks and are very common in the elderly. These can occur almost anywhere in the spine and often do not even need a traumatic catalyst to begin. In many circumstances, the fragile nature of the elder anatomy combined with the weight of their body is enough to cause a compression fracture in the spine. Many of these events are completely asymptomatic, although some may be painful or even the cause of severe neurological symptoms. Multiple or serious compression fractures can cause the spine to lose structural integrity in areas, often escalating the chances for symptomatic stenosis to occur. It is well known that even without any pain immediately, compression fractures can collapse the neuroforamen and even obliterate the patency of the central canal. Obviously these can become extreme dire health issues quite quickly or over time. 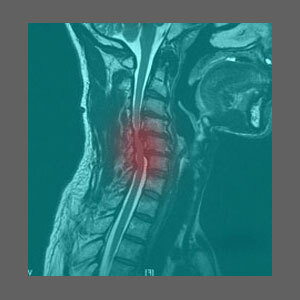 If you have been diagnosed with a fracture of any vertebral bone, be sure to demand advanced imaging, such as spinal MRI, to visualize potential effects on the spinal nerve structures and the spinal cord. X-rays alone will certainly show the fracture lines, but will detail little else which may be useful for preventing future pain, or treating current pain, which is generated as a result of spinal stenosis. This is an especially vital consideration for older patients with compression fractures, since the very nature of the elderly spine is prone to stenosis from the start and any fracture will certainly increase the chances for potentially concerning canal narrowing to begin or worsen. Although fractures are generally handled by orthopedists, we always recommend following up with a neurologist to be sure that the nerve tissues are still fully functional and not damaged or compressed in any way by the fracture or any surgical treatment used to reduce it.